What Does Your Blog's Tagline Say About Your Blog? One of the most overlooked items on a blog is the tagline. As with any great company, website or personal blog, the blog’s tagline creates an atmosphere and first impression for your readers, but most bloggers do not think about it past the time they are filling in the blank while setting up a new WordPress install. Your blog’s tagline tells your new and existing readers where they are and what they can expect in a very few amount of words that is readily seen throughout all of your blog. That is very powerful and it should be thought of carefully as it is an essential part of your branding. That said…I need to tell on myself a little bit. The moment I heard it…I knew it fit perfectly. It spoke to the way of life, obsession with bikes/parts and the desire to get out on a ride every chance we get that encompasses everything that is Bike198. When new readers hit the page, they will get an emotional feeling (read what David Risley says about emotion and blog success) that portrays the site in a perfect manner. “Live the Ride” was born and we are now integrating it into the site and new projects. What Should A Great Blog Tagline Do? A great blog tagline should give your readers a quick glimpse into what your blog is about during that split second interaction with your logo. When you are developing your branding and how you want your blog to appear to outside readers, a blog tagline can go a long way in converting new readers because they will know who you are and what you are about as soon as they land on the page. A great blog tagline should have several characteristics for success. Should be short and to the point to prevent confusion (ideally no more than 5 words if you can swing it). A blog tagline should be factual about your site’s content so new readers now what to expect from your blog as soon as they land on the page. Your blog’s tagline should be original. The tagline should not change multiple times (it is as important as not changing your logo). Ideally…it should be placed with or close to your logo. A successful blog tagline (much like logo design) is often the easiest/hard thing to come up with for your blog. When read, it looks like it was easy to formulate as it just seems to fit. When developing, it can be one of the harder aspects of your branding to brainstorm and get right. Have you thought seriously about your blog’s tagline? Next ArticleAre You Leaving Serious Money On The Table?! I actually have created and help out other blogs all by thinking about the tagline. It not only defines what your mission is for your community, but it also defines your voice. 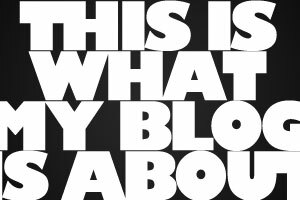 What I do many times when writing a new blog post is I think how it relates to the tagline. Thanks for sharing this. I totally agree with you on this. It’s really important to have a tag line much like having a logo, to brand yourself and set yourself apart from the others.